ffwd or "fast forward," a San Francisco-based startup formerly known as "Vadver," recently launched into private beta looking to offer users a discovery mechanism for online videos. ffwd is the brainchild Patrick Koppula, former COO of music recommendations site iLike. I got a chance to take a closer look at the private beta and provided some analysis. 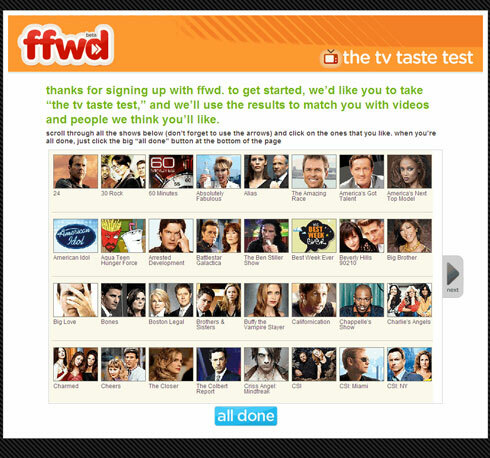 ffwd starts off with a "TV Taste Test" which allows you to select your TV favorites. Although, it is unclear how exactly the "TV Taste Test" first time experience is used in offering recommendation. "ffwd is not a social network. It is a service for accessing all videos in one place and discovering video based on a comprehensive viewer profile (TV and Internet) and the influence of your social network." It offers profiles and the ability to add friends which make its social though it does not appear to be its primary focus. Bottom-line: ffwd is an online video aggregator or startpage in a pretty saturated space with MeeVee, CozmoTV and a number of others - so it will be interesting to see how ffwd pans out.